I'm so inspired by flowers this time of the year and I just love the H&M Home Spring/Summer collection. I'm especially thrilled by the pillow sets, I think they are so pretty. Unfortunately I'm never enough quick to purchase these items, they are usually sold out very quickly. Don't you just wanna jump in the middle of this gorgeous bed? Hope you having a lovely Sunday my dears. I'm grateful for the love I received from you this week. See you soon. Great post, I also like the pillows. i LOVE your fonts. like, they're sooo pretty, i just want to wrap myself up in your blog. and yes, i also want to jump into that gorgeous poofy bed! Eve, Happy Sunday to you. I am in love with the rosette and ruffle pillows in the first picture. The towels, as well, love the texture, seems they would wrap you in softness. All this pink, you pink ladies are wearing me down, never was a pink girl, but now I have been entertaining the pink marketing...Sending you sunshine and tanned legs! Ah, dear Evi, I have this same magazine from H&M on my coffee table as I love the whole arrangement with pink and the blue of the ocean. I love the line! The bedspread is so beautiful! Also love the styling! That bathtub is fab! Hi sweetheart!! How have you been? I haven't stopped by your blog for quite some time! I hope you're well. :) I just love that bed and the sheets... just lovely. This bed is only for pretty cuddle in...is really cozy!!! Love all these images,so romantic and elegant also! Ooh love it! Perfect inspiration! The BED. I love the bed! I was excited when I heard about this line, they have some beautiful items! What gorgeous pictures you have shared. I love the first picture and would love to curl up on that chair with all the beautiful pillows. I just want to snuggle up with my sweetie in that bed! I want to snuggle up with my sweetie in that bed! I want to take a wonderful nap on that bed and wake up to champagne. Oh so beautiful...but then your whole site is just the most gorgeous thing. So nice furnitures, love evrything! Soo nice pictures, love them !! And I Love your blog too, soo beautiful !! those pillows are really quite beautiful! Hope you have a lovely week eve! I love H&M! Beautiful stuff! 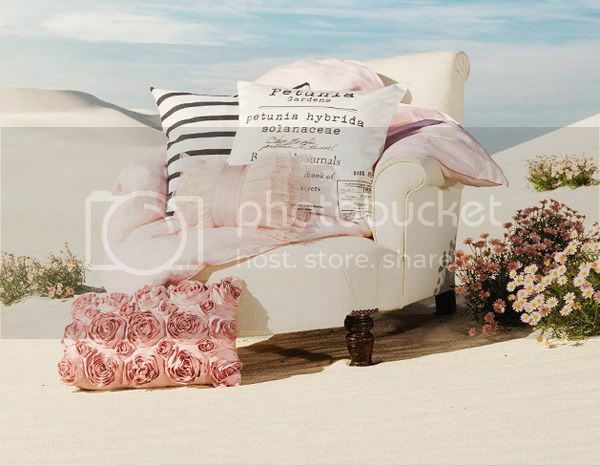 That rose bedecked throw pillow is SO divine! Hello Evi! These are so pretty--I esp love that rose covered duvet, I will have to hit up H&M asap! Also please do stop by, the first photo of my post today reminds me so much of you! So gorgeous, i'm loving the rose cushion. i had no idea H&M had a home collection! Wow!That pillow is great.People are so creative!I love that! Very pretty, love the bathtub! Just found your pretty blog and will be a followers.